We are officially onto surgery #5. #5 will be her Diaphragm placation tomorrow… well, it is tomorrow, however we are all keeping in mind hospital time so if they don’t get time, it may be pushed to Friday. We are prepping for tomorrow though, time TBA as they are “squeezing” her inbetween other surgeries. This does not count her 2 heart cath procedures which are like surgeries themselves nor does it count her multiple PICC line placements or MRI which also required anesthesia and a breathing tube. I’m really okay with this surgery. I felt it was needed last week, but we just had to give her time to “prove” she would fail. Yes, I hate the thought of another surgery. But if that is what is needed, bring it on. I want to get this FIXED and get Annabelle HOME. And since we had to go back to the PICU today because of increased oxygen need and work of breathing (not to mention a fever)… yeah, she proved that she failed. Your continued prayers for our family are so very appreciated, for Annabelle, for my other kiddos dealing with their parents being gone so much, for my mother-in-law helping us out with them, for our finances, and for our sanity. It has been a really long nine-and-a -alf months, and our collective strength in all areas is dwindling a little everyday. I KNOW God is our strength, but I’m reminded of Moses holding up his staff while God parted the Red Sea. He couldn’t do it himself, he needed his friends to help him hold it up. Thank you, thank you, for standing with us and helping to hold up our arms while God does his work on us and on Annabelle. I’d fall in a big heap of blah without you all! FUN thing: I went to the library with Gabby today and got her a library card. OH MY GOODNESS! You should have seen her face! She had the HUGEST smile, grinning ear to ear, when I handed her that card. And when she checked out her books and movies… holy cow. My heart did flip-flops seeing her so excited about something so simple! I like being my kids Mom, and doing these simple little things to give them pleasure. I really really do!!! Another blessing: I got to the hospital today and had a headache. Not just a little one, but a whopping one that made me want to take a baseball bat to my own head. Not pleasant. I took some pills and little help. BUT… my Mom friend txted me and told me the ronald mcdonald house was having a lady there giving free 15 minute massages. I went over, got the last time slot of the day, and mentioned that I had a horrible headache. She spent an extra 10 minutes on my poor aching neck/head and my headache, while not gone, is tremendously improved! YEAH for wonderful people volunteering their services to us stressed out parents in need… (A Moment’s Peace in Franklin) and YEAH for massages. I am "alerting" my friends and we will all be praying for your family. Continuing to pray for Annabelle and all of you. Glad you were able to spend some time with your girls. Will be in prayer tomorrow for the surgery and a positive outcome. Thanks for continuing to take the time to keep us all updated. Your story is such a testimony to many people. Oh she's so beautiful and has came such a long ways! God is sooooo good! My husband and I will be keeping her and your family in our prayers 🙂 stay strong for those beautiful babies of yours!! Verena… THANK YOU!!! The more prayers the better!!! Melanie… Thank you for prayers! I prayed at the very beginning of this that no matter what happened, that God would have glory through it. I pray daily that His glory continues to shine through us. James and Krysta… Thank you! She HAS come such a long ways. On the bad days, I have to keep reminding myself of that. Go back to blog posts at the beginning and remind myself of days much worse, and how thankful we are to still be fighting! Sarah… I think I've washed my hands 50 times today so far! Lotion… here I come! Also Sarah… Praying for your sister!!!!! I know they say that everyone rejects at one point or another usually and that most of the time it is totally reversable… praying they can catch it soon and reverse it and that it continues to work fantastically for her!!!!! Praying for peace in the waiting room as well! Praying for your sweet little Annabelle for this to be the "fix" and for your family to all be together soon. May God lift you all up! 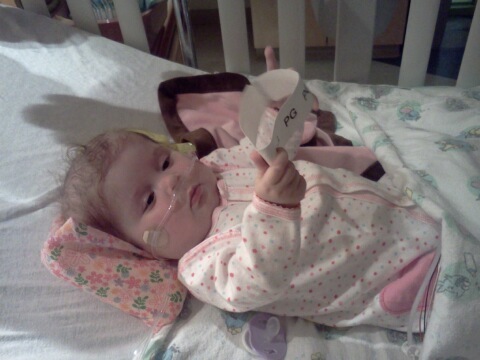 Praying for Annabelle, the doctors, surgeons, nurses, you, Scott, the girls, your mother-in-law, etc. God is with you in all of this! She looks so great- I can't get over how different she looks. 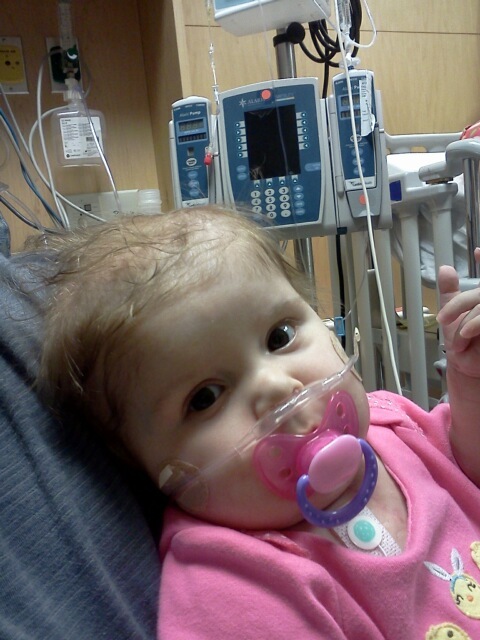 Praying for Annabelle's surgery.